Slots.lv is an online and mobile casino site offering real money slots, table games, video poker and specialty games to players from North America since 2013. Slots.lv is a highly recommend no download casino experience for USD players, and in this review we cover everything from sign up bonus offers, player promotions, games range, deposit and withdrawal options and site reputation and security. Slots.lv is what is known as a no-download, instant-play online and mobile casino site. This essentially means you do not have to download any special software to begin playing its many slots and tables games; all you have to do is have an Internet connection and an up-to-date Web browser (Google Chrome or Mozilla Firefox is recommended) and you can load up the games instantly, whether on computer, laptop, mobile smartphone or tablet (Android, iOS, Windows Phone supported). 1. $5,000 Welcome Bonus – Slots.lv offers all new players a chance to triple their first real money deposit in value and double the amount of their subsequent eight deposits. The first deposit is matched by the casino 200% match up to a maximum value of $1,000, while the next eight deposits you can make are matched 100% up to $500. If you deposit the maximum amount each time, you can get have up to $5,000 to bet with. Upon sign-up and depositing for the first time, make sure to enter the promo code ‘HELLOSLOTS200’ in the casino’s cashier section, and enter the code ‘HELLOSLOTS100’ on the following eight deposits. 2. $7,500 Bitcoin Bonus – As a USD casino site, Slots.lv encourage the use of Bitcoin by rewarding all players who deposit using the cryptocurrency with up to $7,500 in matched deposit bonuses. Just use the code ‘SLBITCOIN300’ upon depositing for the first time and you the casino will match the amount by 300% up to a maximum value of $1,500, while the next eight deposits you can make are matched 150% up to $750 using the code ‘SLBITCOIN150’ at the online cashier. 3. Refer a Friend Bonus – As standard at many other online casinos, Slots.lv, gives up to $200 in free credits if you refer other players via your unique referral code and they sign up and deposit. Slots.lv’s welcome bonus and bitcoin match bonus has a 35X playthrough requirement before the deposit, bonus amount and any winnings can be withdrawn successfully. It is slightly higher than other comparable USA-focused online casinos we recommend, such as Bovada Casino, and is slightly disappointing to note. For a more detailed comparison, check out our guide to the best online casino sign-up offers. All online slots and ‘speciality’ games at Slots.lv count 100% towards the wagering requirements, while table games, some variants of blackjack and all video poker titles count towards 20% of the playthrough roll over. Several games, such as baccarat, roulette and single/double deck blackjack count towards 5%. Craps does not count at all for the playthrough requirements. Players can check their eligibility for ongoing bonuses that run weekly by signing into their account and viewing the ‘My Bonus’ hub page. Slots.lv has a rewards program called MySlots Rewards where all players can earn points while playing their favourite real money slots and table games. Separated into 8 tiers (Depositor Rewards, Signature Rewards, Superior Rewards, Executive Rewards, Elite Rewards, VIP Rewards, VIP Premium Rewards, VIP Exclusive Rewards) members get additional bonuses and offers such as deposit reload bonuses, increased Refer-a-Friend bonuses, monthly bonus draws, weekly cash-back offers, birthday bonuses and maximum betting limit increases. 1 Reward Point is rewarded for every $1 you bet on online slot games and 1 Reward Point for every $4 you bet on all other casino games. Slots.lv’s real money games overall range is decent for a US-facing casino site. It carries a decent range of titles separated into four categories – slots, specialty games, table games and video poker. It ultimately is a lot less than many other top-rated online and mobile casino sites, but for USD players who have minimal choice due to strict gambling laws, Slots.lv is one of the better choices in terms of gaming software. However, what devalues it a little is its high similarity to sister sites such as Bovada and Ignition Casino, which have nearly identical game catalogues. Slots: Over 200 online slots in multiple formats (progressive jackpot, 3D animated, three-reel, five-reel) by BetSoft, Bodog Custom (proprietary games software) Real Time Gaming and Rival Gaming – best games include A Night With Cleo, Food Fight, Money Magic, Super Diamond Mine and Zombies Versus Cheerleaders. Specialty Games: Over 21 niche games by Bodog Custom, including 11 bingo variants, 7 scratch cards, keno, and sudoku. Table Games: Over 23 table games by Bodog Custom, including 8 blackjack variants (Classic 21, Double-Deck, Single-Deck, Perfect Pairs), 2 baccarat variants, 4 roulette variants (American and European), 2 craps variants, Let It Ride, Pai Gow, Carribean Hold’em, Caribbean Stud Poker, Three Card Rummy, and Tri Card Poker. Video Poker: Over 17 video poker games by Bodog Custom, including Bonus Deuces Wild, Bonus Poker, Deuces Wild, Jacks or Better, Loose Deuces and Joker Poker. Bitcoin and credit cards (MasterCard, Visa) are accepted as casino deposit and withdrawal methods for players from the United States, while Direct Bank Transfer is an option available for Canadian players. It is an incredibly low list of options for the average player, and even with the big bitcoin welcome bonus, it’s not enough for those outside of the United States used to having a variety of payment methods. For USA players, it is the standard given many traditional deposit methods are banned from processing gambling payments as per USA online casino gambling laws,. Withdrawals for winnings take 72 hours to process with fees associated with any withdrawals made under $20. You need proof of identification documentation to successfully withdraw. Until recently, Slots.lv was formerly licensed and regulated by the Kahnawake Gaming Commission, a well known and trusted advanced gaming jurisdiction located in Mohawk Territory, Canada. Its lack of current official licensing is something to note, as even with a stellar player reputation and third-party monitoring of gaming fairness by tech regulator iTech Labs, it is paramount an online casino always has official regulation by trusted overseas gaming authorities. We will keep all of our readers informed of when Slots.lv clarify their current licensing and jurisdiction. Slots.lv uses 128-bit Secure Socket Layer digital encryption technology to safeguard the financial and personal information of its players. This is the same type of security used by financial institutions such as banks, and across the World Wide Web. Slots.lv offers a 24/7 live chat service for all new players, including those who have not signed up yet but wish to talk to a representative from the online casino if they have any specific queries or concerns. There is also a toll-free for players from the United States to call (1-855-446-3770) or an online contact form to reach the team via email ([email protected]). In our experience, we found the customer service to be slightly lacking, with many representatives unable to confirm details with us regarding sign up bonus stipulations or deposit option fees, which was disappointing. Slots.lv is an just above average online casino choice for worldwide players. However, for its target market in North America, it offers a much better gaming range, bonuses and customer service than many of its competitors. 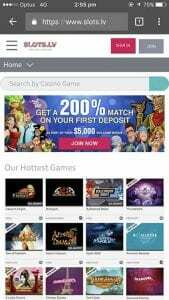 If you already play at USD-facing sites such as Bovada Casino or Ignition Casino you will be familiar with the interface and software as they all share the same games and technology as sister sites, with slight differences – in Slots.lv’s case, it’s more about online slots experiences than anything else. The lack of a current legitimate license from trusted gaming jurisdictions makes us reluctant to recommend them at this time, but their past reputation as for prompt payouts and customer service should be noted for anyone from the United States thinking of signing up with them until they sort out their new regulator. New players can sign up at Slots.lv on computer or mobile (Android, iOS, Windows Phone) via our links to claim up their $5,000 sign up bonus across their first nine deposits – and a whopping $7,500 if depositing on Bitcoin.